With its second expansion the Witcher 3 franchise bids us farewell – at least for a while. The idea to send the witcher on a trip to Toussaint proves to be a great call and an amazing idea for a closure of sorts. Roach-centered quest! (you’ll find out when you play it). Limited options of managing our estate. When the first Witcher game came out, I was but a teenager, devouring Sapkowski's prose and curious to see if adding original new adventures to Geralt’s story as it was depicted in the books (blasphemy!) would even make sense. The night Assassins of Kings launched, I was there, queuing for my copy of the game to be able to play it as soon as possible. I have spent hundreds of delightful hours playing Wild Hunt, and Hearts of Stone showed me how to tell an extraordinary story. 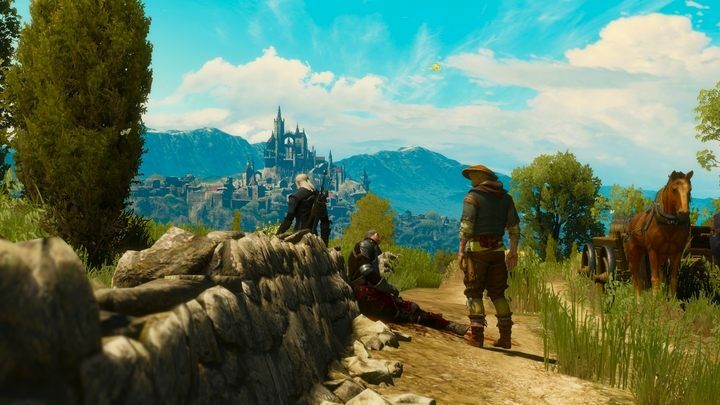 Blood and Wine was faced with the most difficult task of the bunch – not only to raise an already high bar even higher, but also help us say goodbye to Geralt in a way that would draw the curtain on this character's story in a classy manner that he deserves. 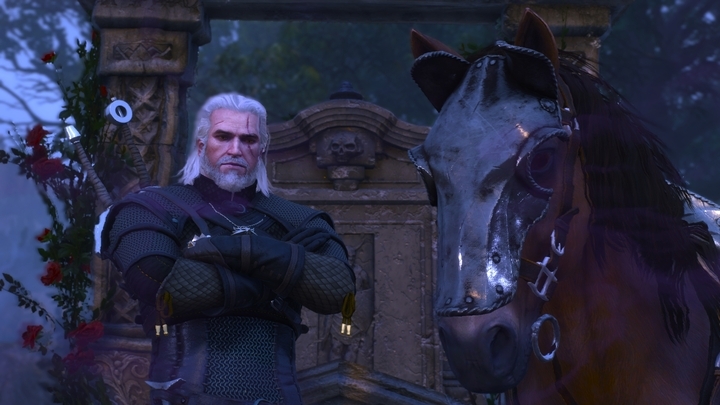 Now, having completed The Witcher 3: Blood and Wine, there’s one thing I know for sure – I envy you as you’re still about to start the last chapter of the adventures of the White Wolf. 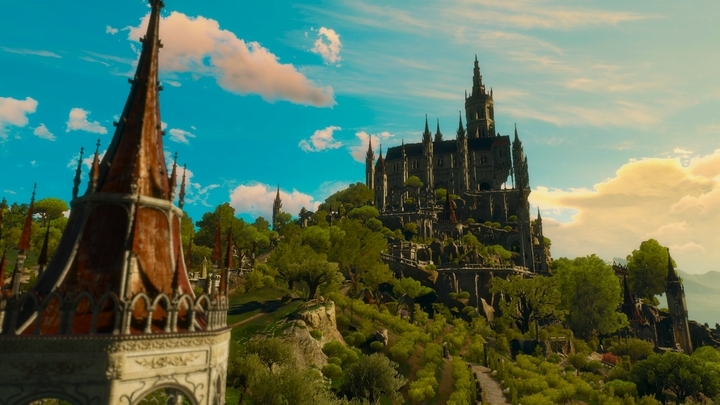 Toussaint – the land commonly seen as a laughable, unreal place of fairy tales, where all undertakings are somehow connected to wine making industry. According to Sapkowski, the duchy, ruled by Duchess Anna Henrietta, gave off an impression of a place where all citizens were drunk around the clock; and that is exactly the land we get in the game. Toussaint is full of life; its buildings surprise us with vivid colors at every turn, and the grapes – carefully tended to by the residents of the duchy – are a permanent element of the landscape. The fairytale-like qualities of this place have their roots in the concept from the books, and the developers did a great job recreating its atmosphere in the game. I have to admit that Toussaint instantly became my favorite region; time after time I found myself just looking around, admiring whatever was looming in the distance, be it far-away villages or the landscape formed by the palace in Beauclair with snow-covered slopes of Mount Gorgon in the background. I came back to the same places at different times of day to see how the landscape looked in the morning sun and at nightfall. Toussaint may look beautiful and innocent, but there's no shortage of work for a witcher. The visuals alone, however, wouldn't suffice, if they weren’t complemented with the right characters and stories – and these are very distinct from the usual Witcher reality. And so we have winemakers, knights-errants, and a whole bunch of woolgathering artists and aristocrats, led by Her Enlightened Ladyship Anarietta herself. 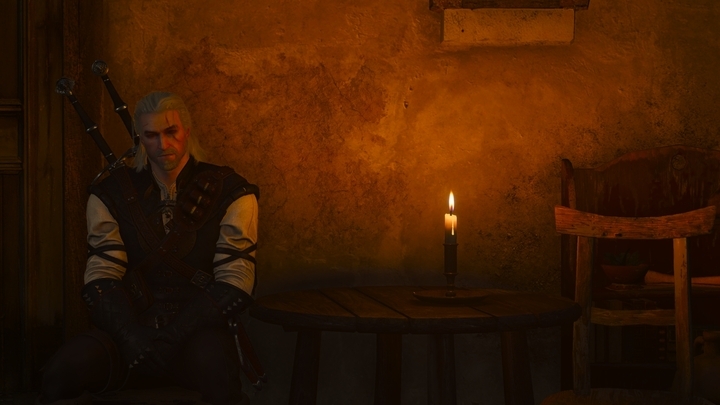 From time to time people play dirty, sometimes demand satisfaction (which Geralt suggests to look for in the nearest brothel), or fall out of the Duchess' favor. We'll be seeing knights competing in tourneys, and even have the opportunity to face them in fair combat while proudly presenting our coat of arms, which is "a lady in blue with hair loose and arms somewhat raised, sitting on a black bear on a golden field threading" (as long as Geralt admits that he’s indeed Lord Ravix of Fourhorn, that is). In other words – you can feel the atmosphere of Arthurian legends being ridiculed whenever and wherever possible. The court etiquette requires proper attire during official ceremonies. However, all those layers of fun and pretense hide a dangerous intrigue. Geralt is summoned by Anna Henrietta to help deal with the deadly Beast of Beauclair. Before the envoys of the Duchess departed for Velen in search of Geralt, the creature had already killed two knights. Only a witcher will be able to find the dangerous monster and get rid of it for good. 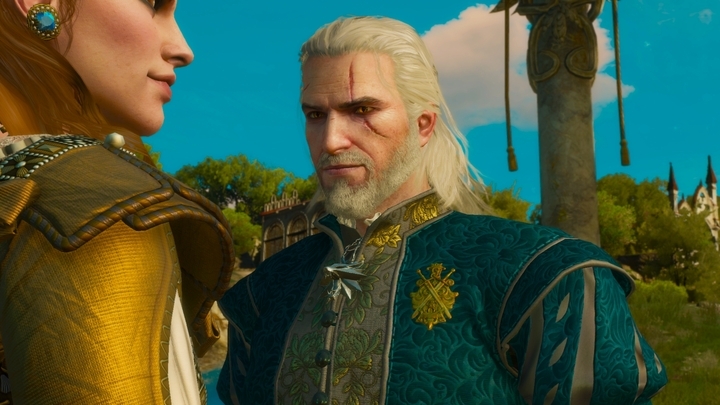 I don’t want to reveal too many details about the plot, so I will only say that involved in the whole affair are bloodsuckers, a surprisingly large population of which lives in Toussaint. The main storyline is intriguing, and every step leads us to discovering new facts that suggest blackmail and extremely clever manipulation. While in Hearts of Stone it was the dangerous power playing games with mortals, this conspiracy is the work of someone who has learned how to use such powers to their own purpose. Ladies and gentlemen sporting fangs will stand in our way on more than one occasion. Of course, apart from the main contract from the Duchess, there's a whole bunch of side quests for Geralt to complete. This includes the usual: hidden and guarded treasures, bandit camps, and deserted places; but there was also room for some new additions. The witcher can now participate more actively in restoring peace to the land through the elimination of headquarters of various hansas (armed groups). Such places are heavily fortified and guarded by small armies of enemies awaiting us inside; to conquer them we must also dispose of the hansa's leader. If we can capture such a location, the operation of bandits and ravagers in the area will suffer a major blow. Dozens of new schematics are waiting to be found, enabling us to upgrade our gear to grandmaster quality as well as get access to Manticore School Gear, which should ring a bell to the fans of the first Witcher. There is also a large number of monster contracts, the roster of which has been expanded with several new species, including Scolopendromorphs, Shaelmaars, Spriggans, and Wights. Among the side quests we will also find several that guarantee to make you laugh, but I'll leave it to you to discover them. 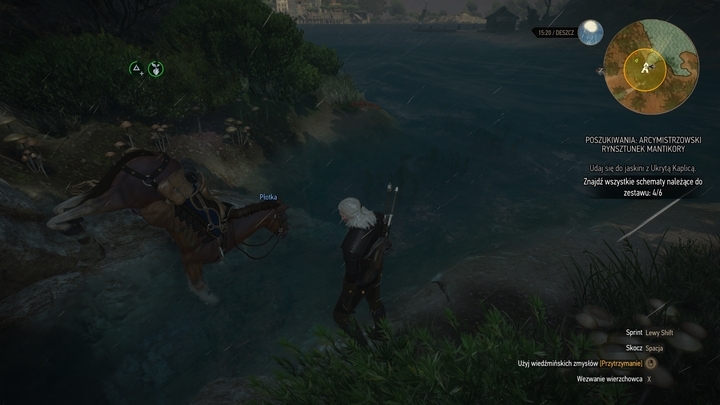 Shortly after arriving in Toussaint, Geralt is given the ownership of the vineyard Corvo Bianco. His new home is in a rather sorry state, but it’s nothing a certain amount of cash wouldn't remedy. The witcher can spend his hard-earned money renovating the estate as well as introducing some useful upgrades. Apart from the visual qualities, the expansion of Corvo Bianco also supplies Geralt with certain bonuses. And so a sturdy bed will provide a temporary boost to vitality, the laboratory will increase the number of potions and bombs we can carry, and a stable will increase Roach's endurance. Our servants can also grow herbs, which will be useful when creating new potions, and nothing stops us from displaying armor and weapons on stands or decorating the walls of our house with paintings. All activities related to Geralt's new home are pretty well executed – the estate itself gives off the impression of being essential to the story rather than an element included just because. All I need now is an option to decide how to decorate selected parts of my homestead or choose a predefined house theme. A small thing, but it would make Corvo Bianco feel a bit more home-y. 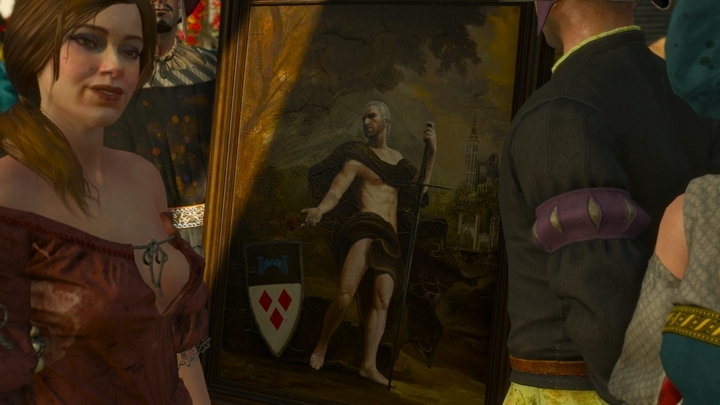 Any self-respecting Toussaint aristocrat should have his portrait hanging on the wall. The creators have also decided to introduce a new element to the character progression system – mutations. During his stay in the duchy, Geralt will stumble upon the workshop of the late Professor Moreau, who used to be deeply engaged in the research concerning witcher mutations. The new system allows us to use unnecessary mutagens and skill points to unlock powerful mutations that will significantly help Geralt in combat. Moreover, researching new mutations will also unlock four more slots for the already acquired skills. The more powerful the mutation, the more points we have to spend on it, so the possibilities of this system can be fully exploited only in NG+. The new system finally gives us the opportunity to utilize the surplus skill points, which so far were usually spent on things we wouldn't really need. If you intend to continue the game from a saved game after the base game and the expansion, you should use the Potion of Clearance to reset the skill points, then select only those skills that are actually used in your character build, and devote all the rest to researching new mutations. Remember, however, that only one mutation can be active at a time. Gwent fans will certainly rejoice at the news of the addition of a whole new faction – Skellige. New cards can be tested in battle during the great tournament, but first... we need to collect them. The organizer of this competition allows us to participate but only on the condition that we play using the Skellige deck. We get some basic cards and set off to battle innkeepers, herbalists, a madam, and even a butcher, just to assemble a complete deck. I'm used to playing with Kingdoms of the North, so switching to a new faction was not easy, but the new deck proved to be quite fun to play actually. 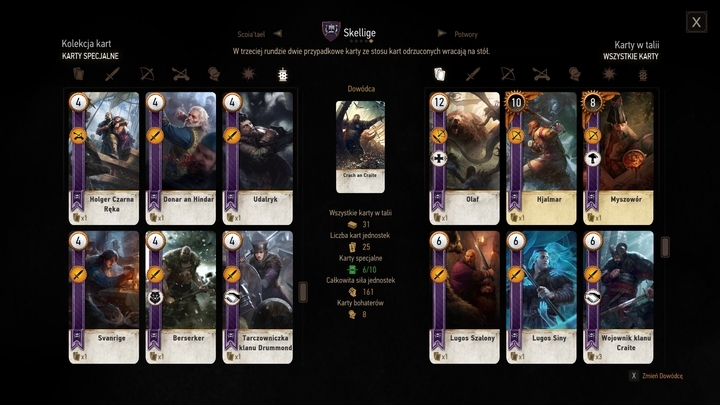 The most important additions are: Skellige Storm, which activates weather effects in the second and third row, two cards that summon a specific creature for the duration of one round when discarded, and the berserkers whose transformation can be accessed by a special card, Mardroeme, or through the new hero card – Mousesack. The Skellige deck stirs much controversy among the Gwent-playing population of Toussaint. The interface has seen some major changes, thus becoming much more transparent. The inventory was divided into 5 major categories, broken down into further groups. Now we have separate tabs for swords, armor, Roach’s accessories, oils, bombs, and potions. No more tedious scrolling to find that one thing you need. There were some visual changes as well, and the ability to display a book, letter or a map we’ve just picked up with a single button is certainly handy. The next paragraph contains minor spoilers on several characters appearing in the expansion, so if you’d rather not know about their role in the game, resume reading below the next picture! I had high hopes for Blood and Wine, but all my expectations were met in full. We got a great deal of well-written characters, including some that have appeared in Sapkowski's books. We have the aforementioned Duchess Anna Henrietta (who turned out to be not as timid as Dandelion claimed), we have Baron de Peyrac-Peyran, and we have Regis, back from the (un)dead. 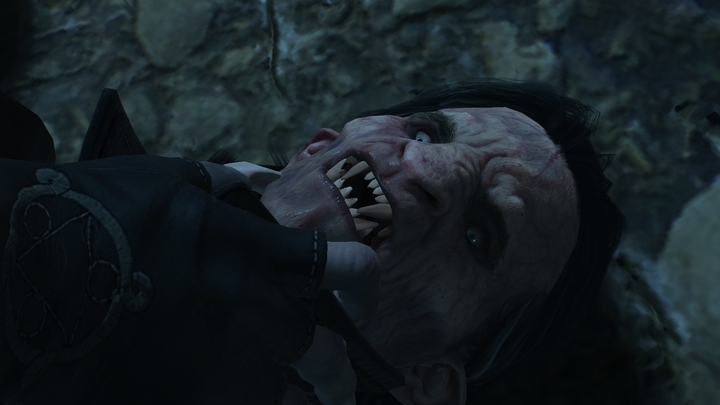 Readers of the Witcher saga may wonder just how the vampire managed to weasel his way into the game, but everything was rather neatly explained, and I find this explanation to be completely acceptable. The bloodsucking herbalist accompanies us for a major part of the main storyline, providing us yet again with the opportunity to witness those peculiar conversations between him and Geralt. The writers deserve special praise for perfectly capturing the aura of the relationship between the two. It took me less than 30 hours to complete the expansion and I'm pretty sure I found everything Toussaint can offer. I didn't, however, take the time to carefully read through every letter and book I collected; what's more, I began the expansion with a level 40 character (save game after the completion of the core game and Hearts of Stone), and the game is recommended for Geralts around level 34, which means that I had an easier start. Thorough explorers will take between 35 and 40 hours to complete Blood and Wine. I encountered some occasional glitches, but with no negative consequences to the gameplay. The expansion is very stable, I would even say that the game gained a few FPS in the new location, with identical visual settings, which is probably due to the patch released simultaneously with the expansion. Once I witnessed a rather bizarre situation; shortly after my NPC guide praised the excellent weather conditions, perfect to paint a portrait, the rain started pouring. This event, however, didn’t affect my companion's creative process, with me posing, wet, under "ideal light conditions". Neat, isn't it? A work by Faramond himself. The second expansion is treated as a closing chapter of sorts, and we can feel it during the game. 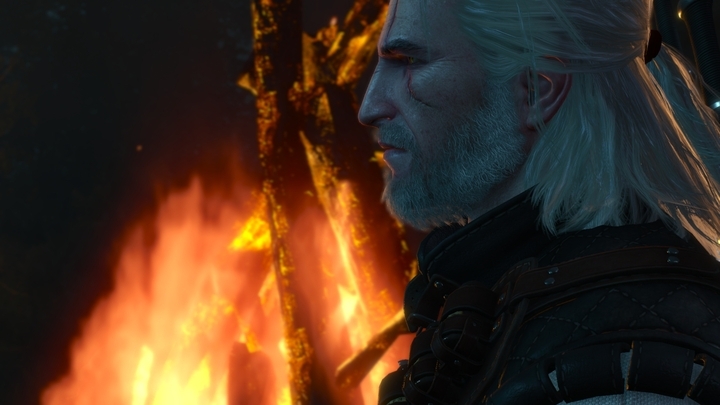 Geralt finally gets to own an estate, and the final conversation with a friend by the fire, spanning until early morning hours, is a subtle nod to the players. And while we're on the subject of nodding, I can’t avoid mentioning the plethora of references to Sapkowski's books, the witcher's previous digital adventures, and the pop-culture in general (like the poor fellow Smigole Serkis, who lost his treasure). There's a ton of such tiny little tidbits, and discovering them can bring a smile to one's face. So what’s the final verdict about the second expansion to Witcher 3? 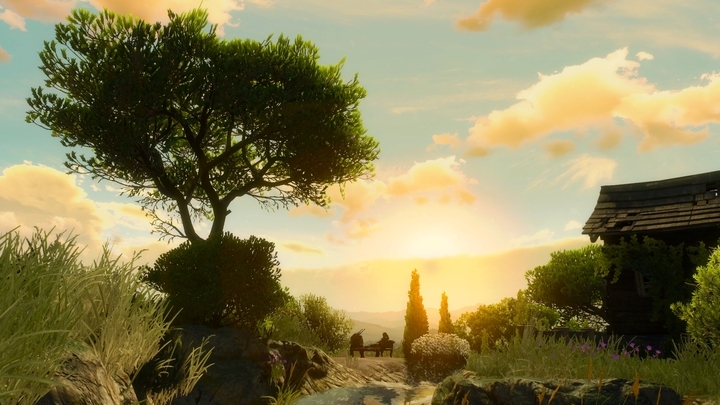 Blood and Wine is an adventure spanning many hours during which we'll get even more of what we’re already familiar with and a couple of new things thrown in the mix. Those of you who thought that Hearts of Stone had too much talk and too little action will be pleased this time. At the same time, those who praised the consistency of the plot and the unusual approach to the narrative in the adventure starring Master Mirror can rest assured that this story is just as unusual. Every story, however, must come to an end, and I can say without a hint of doubt that this ending is satisfying in every respect. Time to take a deep breath and brace ourselves. Next time we see each other, it will be in Cyberpunk.